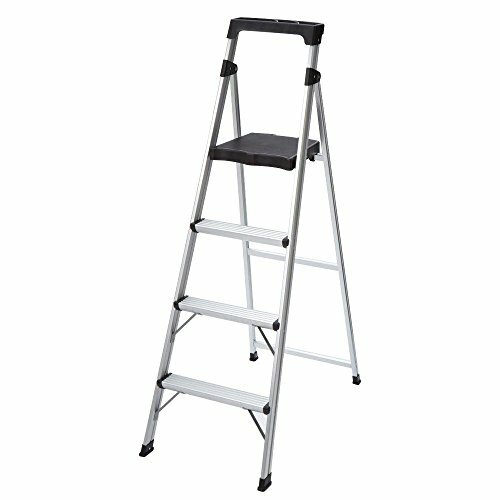 A lightweight 4-Step Aluminum Step Stool that is a perfect alternative to a traditional 6 ft. stepladder. This step stool is 5 ft. tall and features a huge platform top step for comfortable and secure standing, yet weighs only 11 lbs. The integrated project top is perfect for holding tools and hardware while working and the non-slip steps make climbing safe and easy. The self-locking safety latch allows the step stool to be folded up and stored away quickly and easily. Safe for use both indoors and out, this is the ideal project ladder for every home. Lightweight but durable aluminum construction - weighs less than 11 lbs. If you have any questions about this product by Gorilla Ladders, contact us by completing and submitting the form below. If you are looking for a specif part number, please include it with your message.